Still working on restocking my stash of masculine birthday cards. Here's another toolbox style card I cut out with my Cameo using Silhouette cut file 136223 by Lori Whitlock. 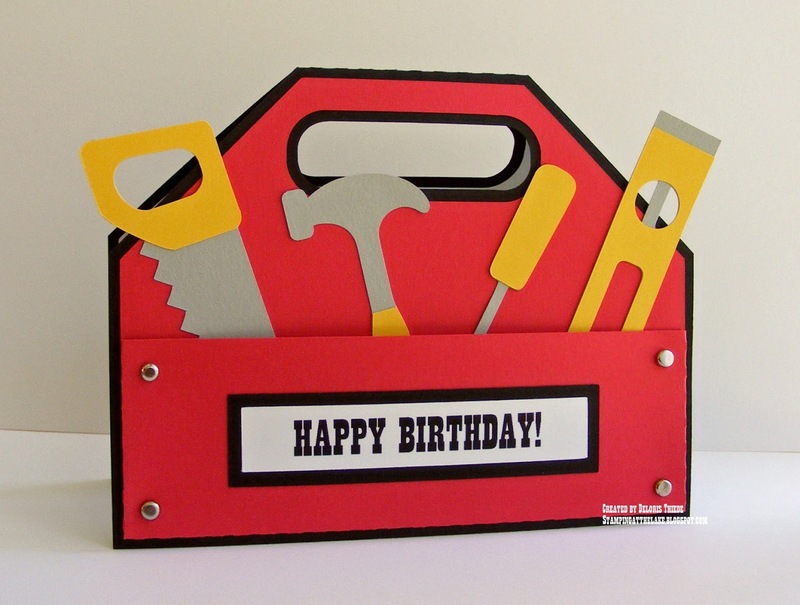 Inside sales "Hope your day is Tool-ific!" You and Sue are breaking my bank with the cute Silhouette files you are finding. Got my new Cameo and was given $25 gift certificate so I'm checking and adding to my wish list. Yep, I love man tool boxes for some reason. Probably because I have crafty tool guys in my family! Thanks for sharing! Thanks for joining us over at Glitter'N'Sparkle for our 4th Birthday celebration,, hope to see you again and good luck in the draw. This is fabulous Deloris, a super masculine design. Great masculine card! I never seem to have enough of those! Thanks for sharing at Glitter 'N' Sparkle!